You think your fantasy football league is tough? Not like these guys it isn't. 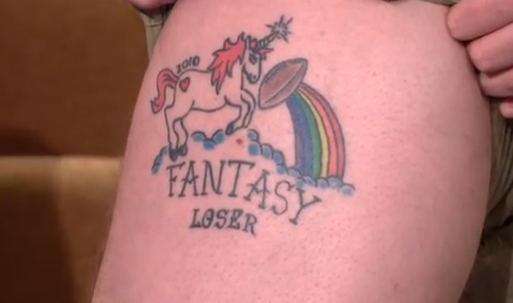 A group of fantasy footballers in Nebraska have come up with quite the inventive league that punishes the last-place finisher, it would seem, as much as it rewards the first-place winner: getting a really, really bad tattoo. The tattoo rule is this: If your team finishes dead last in the league, you have to have a tattoo (designed by the other owners) placed on your body in a four-inch-by-four-inch space (that the loser can choose). Some consolation, eh? As you might imagine, the designs aren't, uhh, flattering. Back in October, three of the owners appeared on The Tonight Show with Jay Leno to discuss their inventive methods of fantasy torture. "The whole purpose of this league was to punish the loser so that everybody played as hard as they can every week," says one of the entrants. Some of their handiwork is quite impressive. Stunning, really. Field-goal-kicking unicorns? Justin Bieber? Tim Tebow, in the form of a Tebowing Care Bear? Not sure what exactly that is, but great stuff, guys. Really. Bravo. 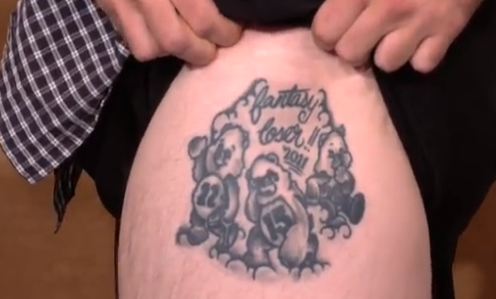 And they all share the same two-word phrase in common: "Fantasy Loser" and the year they lost. 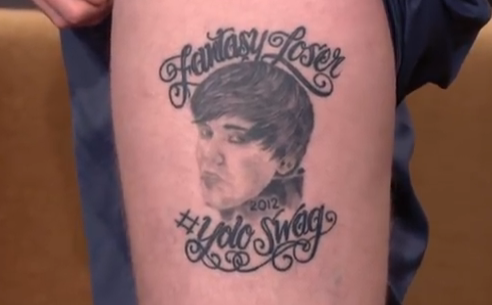 You know, just in case they happen to forget why the tattoo was there in the first place.